So that simulation was very simple pFlow rig. I have made 2 blasts in pFlow – one leaving trails, second one filling in the center of explosion. 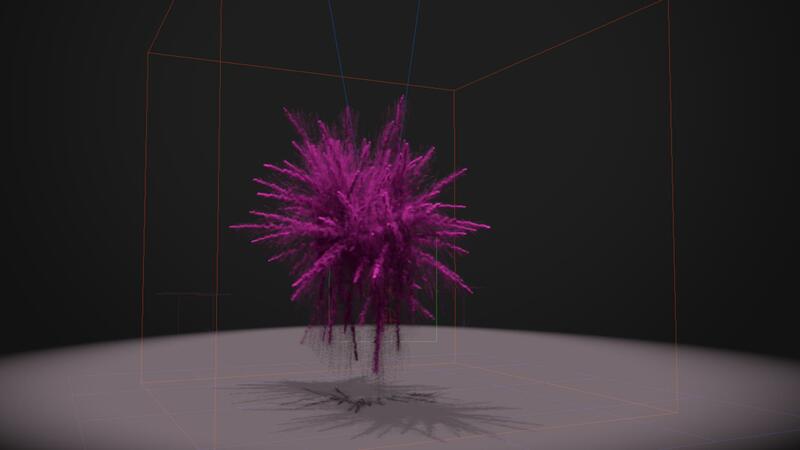 Since this simulation was designed to cover up the object which emitted the powder for further object removal in Nuke or AfterEffects composite. Key to achieving that behavior was dampening the x and y movement of particles (since powder is light and reacts heavily with air friction I guess… ;). Than to wiggle it gently towards the land of -Z where everything dies. Well then FumeFX everything! As little as possible advection stride, almost no vorticity, temperature same as for storing good wine, diffusion nill. As it goes for fume’s grid i did it with 350x350x350, then you need wavelet for the extra touch so make it sim extra detail channel for the secondary simulation (wavelet that’d be). I guess I have animated the drag force from zero to something like 10% (give or take depending on your simulation scale) but only on x and y axis (leave Z alone!) and stuffed it into Fume’s list. I was about “TAA DAAA” but than noticed the lights. Yes, add those, 2 of them ‘d be nice. Taa Daaa! Is it possible for you to share more details/values & other setup specs for fumefx ? Thanks & amazing inspiring work ! Will do in the future. As much as I try to fall by gravity this kind of simulation is suspended in the air, some help you can give me? It needs to be combination of gravity and temperature – you just need to find the sweet spot for your scale. I’m so interested in this project! Could you leave more information? I’ll appreciate it! Hey can you help me to reproduce this. I would really like to use it. by adding gravity, lowering temperature or both. Is it possible to buy these beautiful simulations?